There are a plethora of other flare types used to effectively burn off gas and handle emergency depressurisation. Some of these are highlighted below. Enclosed, concealed or ground flares are designed to hide the flare flame from view through the construction of a refractory (castable or ceramic fibre) lined enclosure which also serves to reduce radiation and noise. The flare burners themselves are frequently designed as arrays with multiple tips. These types of flares are generally only seen on onshore facilities due to their size but have been installed offshore on FPSOs. There are two distinct types of ground flare enclosure. The traditional ‘box’ type uses rectangular panel sections to build up a square or rectangular footprint. The ‘cylindrical’ type is normally the most compact and cost effective route to take and can be constructed to higher elevations than the ‘box’ type. An integral part of the design is the wind smoothing fence located around the base of the flare and internal wind baffles located beneath the burners. 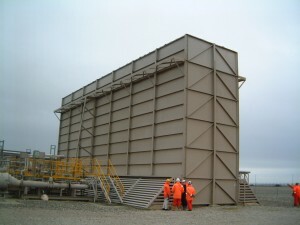 This arrangement smoothes the air flow throughout the ground flare enclosure to enable greater combustion efficiency. The ground flare is normally designed with sufficient staging to allow efficient combustion at low and continuous flows whilst minimising the purge gas requirements. It may have up to six stages with each stage a usualy factor of 3x the flow rate of the previous stage. Hence a four stage system with a 1st stage flow rate of 1500 kg/h would have a total capacity of 58,500 kg/h. The ground flare itself is commonly used as the 1st stage of a flare system with an elevated flare as the 2nd stage. The 1st stage groundflare may handle up to 10% of the total flow and is designed to conceal the day-to-day flaring and render it smokeless. The 2nd stage elevated flare is normally designd to handle 100% of the design flow, which allows the 1st stage ground flare to be periodically taken out of service to carry out maintenance. A burn pit flare is a single or multi point flare positioned horizontally over a dedicated pit or bunded trench. The pit retains any condensates or liquids released with the gas. Although this is the most basic of flares and little attention is paid to smokeless flow characteristics there are one or two enhancements that can make maintenance easier and extend the lifetime of the pit flare tip and pilots. Firstly the use of a carrier tube to house the flare tip and secondly the use of a burner block at the tip outlet. There are a myriad of assist gas flares to choose from which perform the tasks of smoke suppression or flare gas enrichment. Smokeless flaring is desirable and that can be achieved readily for high pressure flares, however low pressure flares lack the energy and momentum within the gas to create good mixing with atmospheric air. An outside force is required to create the environment for good air / flare gas mixing and smoke reduction. The use of fluids such as steam, forced air and plant fuel gas are commonly used where readily available. These are some of the biggest elevated flares around generally found on onshore facilities like refineries and chemical plants. They require large quantities of steam at a pressure of circa 4 barg. The quantity of steam is proportional to the maximum day-to-day flow rate that needs to be (or can be) smokeless. Hence steam flares are more often than not specified with a certain percentage smokeless capacity to cover known planned flaring siuations and also unknown process upsets. This figure commonly specified is 15% of the total flare capacity. For small to medium sized steam flares up to 48” in diameter this will be covered by external steam jet nozzles and a single internal steam nozzle. Some applications have higher flare capacities and higher smokeless capacities. Noise may also be an issue. In these cases the steam flare can be designed with more steam nozzles inside the flare tip itself. When steam, the first choice medium of smoke suppression is not available or where the environmental conditions dictate, an air assist flare system using an air blower / fan provides a good solution. The air and flare gas should be introduced as two separate streams into the flare tip. Either the air riser or the gas riser will form the main supporting structure for the flare tip. The air-assisted flare tip is designed with a vane type mixing head which enables primary forced draught air (from the blower / fan) to aerate the gas core and create some turbulence which in conjunction with the ambient air achieves good smokeless combustion. The tip also gives lower radiation levels than a conventional pipe flare, although worst case radiation calculations are always based upon a ‘no fan’ scenario. To cover various smokeless requirements multiple blowers or blowers with variable speed motors can be used. Where it isn’t possible to use steam or air-assist systems or where there is an abundance of gas, hydrocarbon plant fuel gas can be used to achieve smokeless combustion of low pressure hydrocarbon gas streams using single or multi point flare tips with gas injection rings for example. Low BTU gas flaring may involve acid gas, ammonia or a hydrogen / hydrocarbon gas stream with a large inert gas content such as carbon dioxide or nitrogen. There are different ways to handle each case, some may involve enrichment of the flare gas within the flare header as far upsteam of the tip as possible, some may require direct introduction of hydrocarbon gas at the flare tip itself to effectively destroy the flare gas stream. Low BTU flare tips are normally provided with an extended wind cowl to protect the root of the flame from cross winds and in some cases additional pilots and a dual pilot ignition system to ensure flare ignition. Where steam, gas or air assist is not possible for smokeless flaring, sea water can be used to reduce smoke formation and lower thermal radiation. This is a common method for offshore flares and has been used in drilling operations for years. The water is injected into the flare gas itself through a special nozzle or a series of nozzles designed to atomise the water into small droplets. The water droplets or mist is entrained into the high or low pressure gas stream which exits the flare tip and is then ignited by the pilots.